Pop over to Amazon today to get the Kindle edition of Unglued by Lysa Terkeurst for just $1.99 (pretty sure this price is only good today). This is a great deal for this recently released book which retails for $14.99 in paperback. 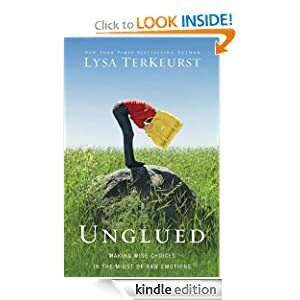 :: Read reviews of Lysa Terkeurst’s Unglued: Making Wise Choices in the Midst of Raw Emotions, here. Linking to Amazon through our site helps support Frugal in Fort Worth (bunches of thanks!). This entry was posted in Books and Magazines, Cheap, Dallas, Fort Worth, Stretch your Dollar! and tagged Amazon Kindle, Amazon Unglued, Fort Worth, FREE Kindle Books, Lysa Terkeurst. Bookmark the permalink.